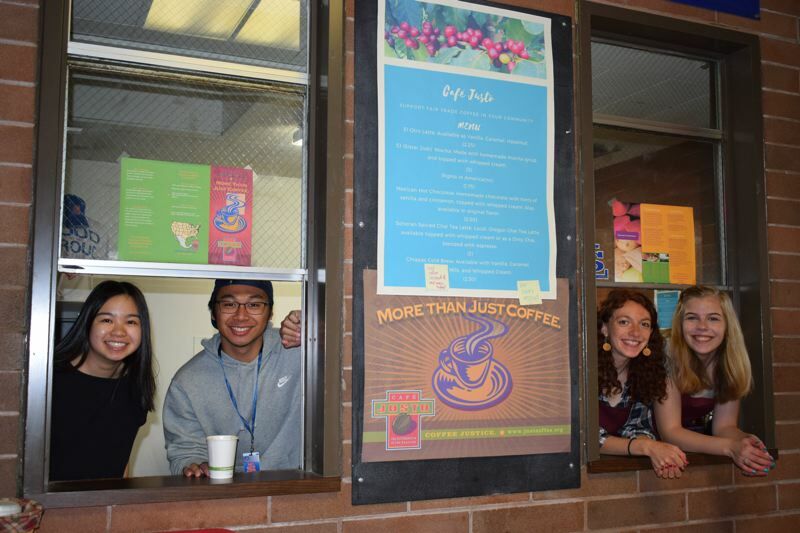 Cafe Justo opened at La Salle Prep this month, selling coffee drinks to support Mexican growers and raising money for scholarships. Located in the former school store on the edge of the cafeteria, the cafe is open before classes on most Fridays during the school year. The student-run shop buys its coffee from Cafe Justo, a co-op based in Chiapas, Mexico, that supports coffee growers by selling their products. Students work in the shop for free; channeling all proceeds and tips to a scholarship fund. "I want this shop to symbolize fair trade and justice for everyone," said barista Lenora Mathis, a junior. "I hope it can bring together the La Salle community while also connecting us to other parts of the world." Emma Ly and Christian Reyes, who graduated in 2017, came up with the idea for the coffee shop while on La Salle's 2016 immersion trip to the U.S.-Mexico border. They were inspired by their visit to the headquarters of Cafe Justo during their journey. Reyes, who now studies at the University of California-Berkeley, says he and Ly wanted to support the co-op and help more La Salle students go on eye-opening immersion trips. So they applied for a La Salle Dare to Dream innovation grant to open a coffee shop at school, buy coffee from Cafe Justo, and put earnings toward scholarships for students who wanted but couldn't afford to go on an immersion trip. They winked at LaSalle's motto, "Enter to learn. Leave to serve," by calling their proposal "Enter to learn. Leave to serve coffee." After getting a Dare to Dream grant for $8,000, Ly and Reyes started hashing out the details. Then, knowing they were heading off to college soon, they put out the word they needed younger students to keep the project going. Mathis and Brigid Hanley, who will graduate in 2019, stepped up. With the help of school staff and parent volunteers, the two juniors cleared, painted and installed a coffee machine in La Salle's former school store, transforming it into the new coffee shop. They took a barista class, practiced making drinks and hired student workers. "Each cup of coffee," said Mathis, "is a reminder of all of the hard work put in to make it what it is, starting in Chiapas, Mexico."